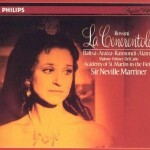 This ever-popular recording is a true gem of the La Cenerentola discography. Under the direction of Sir Neville Marriner, the St. Martin in the Fields orchestra offers a performance full of charm, style and sensitivity. With pacing that alternates between lively and gentle, unhurried recitatives that allow for maximum emotional expression, and an excellent balance between joyful exuberance and thoughtful, delicate phrasing, Marriner’s reading of the score perfectly captures both of the two sides of this particular opera. He perfectly balances the sparkling, frothy comedy with the sweetly sentimental morality tale. 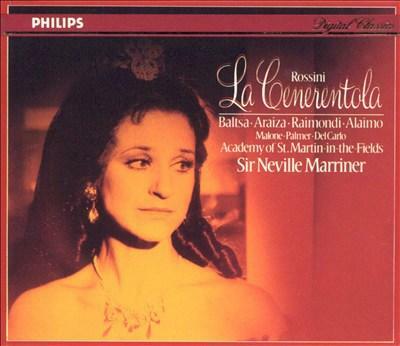 Among the singers the star attraction is, appropriately, Cenerentola herself, the outstanding Agnes Baltsa. Her warmly feminine, sweetly opulent voice combines lovely tenderness and vulnerability with truly princess-like vocal authority and stellar virtuosity. As Don Ramiro, Francisco Araiza may lack the pure, sparkling tone of other Rossini tenors, but his uniquely robust, bittersweet sound and vivid delivery of the text creates a wonderfully regal and passionate characterization. Ruggero Raimondi, although rarely associated with the basso-buffo repertoire, is a vibrant and endearing Don Magnifico, his warm, slick, luxurious bass-baritone balancing exuberant humor and blustery temper with at least a dollop of genuine aristocratic dignity. Simone Alaimo is an appropriately charming, witty Dandini, while John del Carlo, despite a slightly dry timbre, infuses Alidoro’s music with an ideal sense of sage-like wisdom and kindness. The charmingly sung stepsisters of Carol Malone and Felicity Palmer round out a first-rate ensemble. 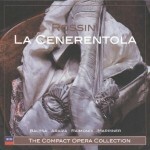 It’s no wonder that ever since its release, this recording has been beloved by Rossini devotees. Whether as an introduction to Cenerentola or as the tenth or eleventh addition to a collection, I recommend it wholeheartedly. sublime ! e che altro ?